This dish pairs nicely with a roast pork tenderloin for an elegant main course. The pickled blackberries can be made a day ahead of time. It’s a nice transition dish from later summer to early fall. Brush off any dirt from chanterelles with a slightly damp paper towel. Whatever you do, don’t wash them, as they will become waterlogged and not sear properly in the pan. In a large sauté pan over medium heat render the fat out of the guanciale. When the guanciale is crisp, remove it from the pan to a paper towel for later. Reserve the fat in the pan. Now turn your burner to high. When fat is nice and hot add the chanterelles and rosemary or thyme. Stir gently for a minute and then add the shallots, garlic and chili flakes. When the mushrooms start to crisp around the edges, add the sherry and chard. Use tongs and gently mix until sherry reduces and chard is wilted—about one minute. Taste and season to taste with salt and pepper and a squeeze of fresh lemon juice. 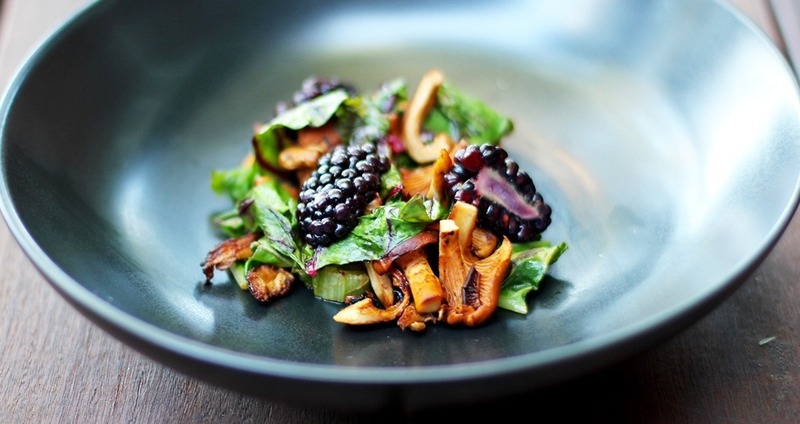 Serve garnished with sliced pickled blackberries and crisped guanciale. Bring all ingredients (except for blackberries) to a simmer in a small saucepan. Remove from heat and allow brine to cool completely. Pour cooled brine over blackberries in a container and refrigerate overnight.